the difference is the size of the inner circle and the size of the petals. 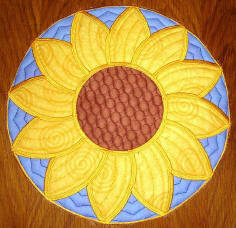 You can either just make the sunflower, or turn the Sunflower into a round placemat by using the small "triangle" panel provided in this set. The 6x10 Sunflower has a 6.2 inch inner circle, and the petals are shorter than that of the 5x7 Petals. 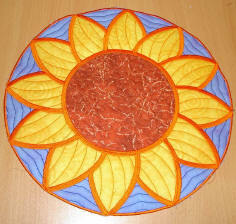 A Flower Petal - in 3 quilting variations.